A cloud-based contact center is a flexible, scalable, and shared environment deployed as-a-service that is optimized to run over public networks. However, it’s important to understand the difference between a hosted solution and a cloud-native solution. 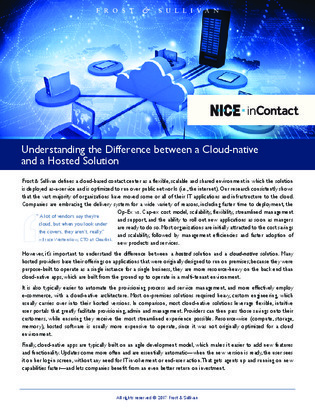 Download this brief one-page Frost & Sullivan report to better understand the differences between hosted and cloud-native capabilities.